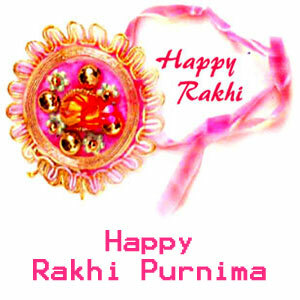 Rakhi Purnima celebrated on the full moon day (Purnima) of the Shravan (Sawan/Aadi) month of the Hindu calendar. In 2012, Rakhi Purnima falls on 2nd August. Rakhi Purnima is a festival which celebrates the bond of affection between brothers and sisters.It is celebrated to make the relationship more stronger. Rakhi Purnima is marked by the tying of a rakhi, or holy thread, by the sister on the wrist of her brother. The brother in return offers a gift to his sister and vows to look after her as she presents sweets to him.